And today has some lovely things in it already. with our grown up daughters last year. when my kids have wandered off the proper path to being grown ups, and I don't judge her three kids either, although we are both quick to point out how stupid some of our children's actions are. The only thing on my schedule for the day was a phone call with someone in France who is looking for a housesitter, so I looked forward to that. I'm sitting here now waiting for her call. Four cats in the Loire Valley. I also have another interview -- Facetime, so I need to look respectable -- with a couple outside London who need a housesitter for their two dogs and dachshund puppy! Yes, I know that London isn't in France, but one of the benefits of living in France is being able to explore other countries as well. Earl has never been to the U.K., so I thought it would be a good chance to explore. My day is filled with dreams and searches for airlines and hotels and house sitting opportunities. I love it because I can dream about the endless possibilities. On the visa front, a friend in Aix en Provence has said we can use her address as our permanent address while we are in France. That means we have to spend time in Aix en Provence to present our papers to the local government. I do love Aix. An attempt at an artsy photo on a morning run in Aix. The telephone wire kind of ruins it. So slowly, we are getting all of our necessary documents and we'll keep working toward that visa. As my friend in Aix said, "You go get that visa, girl!" Today, I clicked on some travel sites and started searching for plane tickets. Yes, in a short 130 days, I should be headed to France. Here's a sunrise picture out the window. Can't wait to see it again. Here's the screen in the seatback that showed me our progress throughout the trip. Okay, there are a few hurdles yet. The house hasn't sold. My husband hasn't retired yet, but, by golly, we're going. My latest plan is to drive to my parents' house in Florida, store a few things, and drive to an airport down there -- Orlando or Fort Lauderdale or Miami. Just entering those airports inn the travel search brought up airlines I wouldn't usually see if I flew out of Columbus or connected in Detroit. Where was Air France and Delta? Instead, TAP Portugal popped up. And the flights would take over 11 hours with stops in places like Iceland or Dublin. Usually, we had a straight shot from Detroit to Paris. A tired Earl on the tram through the airport once we arrived in Paris. Pablo Picasso seems wide awake and a bit intrusive in the poster on the wall. Maybe we won't be able to fly out of Florida. Maybe we'll have to fly out of Columbus. But what I do know is that once those airline tickets are in our hands, there's no stopping us. We have so many things to figure out. We need to order new birth certificates and marriage certificates and have them translated into French. We're looking at health insurance to cover us for the entire year. We'll need to share our bank accounts to prove we have enough money to survive for a year in France without working (which shouldn't be a problem once we finally sell the house). The only catch is that we need to show we have a place to stay for the year. We actually are planning to move around quite a bit. As I shared a few weeks ago, we are scheduled to house sit for a menagerie of animals in January. 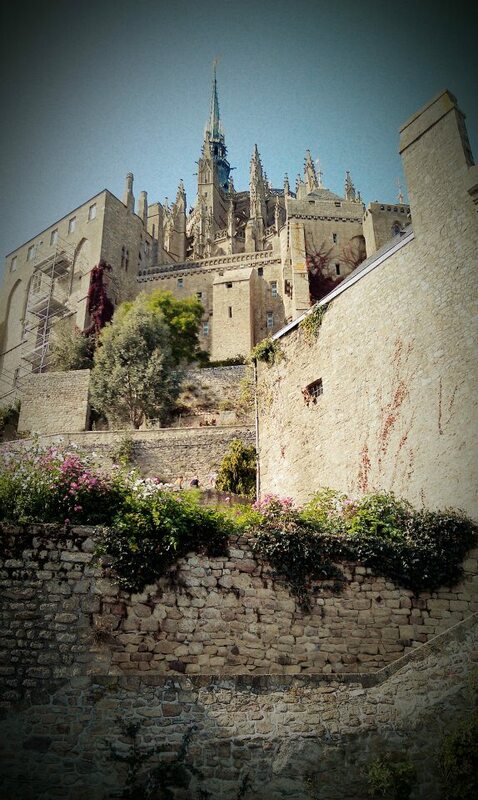 So we'll start there and we are still negotiating for house sits in Aude and the Pays de Loire in February and March. (Fewer animals at those houses). And, of course, we can also rent a place to stay through Air B&B. Or in the mountains of Quillan. We actually want to stay some more in our chosen towns to see if they are the right fit for us. I'm generally an optimistic person who thinks that surely the rules can be bent for me. I'm not sure why I think that since I can't recall a time when the rules were actually changed to allow me to do what I wanted. So I messaged my friend Delana to ask her what to do. Maybe she can claim she invited us to stay with her for the year. Or maybe we can talk to our friends in Nantes and see if they will write a letter saying that we will be their guests. Can you imagine how complicated it might be to convince a French-speaking person to claim we'll be their guests but we won't actually be their guests? I can picture the hilarity that would ensue as our friends try to figure out how to tell us that they don't want us to stay for the entire year, or they expect us to stay and we never show up. I'm sure there's a way around this. As the time grows near, I'm more and more excited and ignoring some of the negatives that loom ahead, like selling the house. I'm sure we'll have all the visa details worked out by the time we make our appointment at the French consulate in Chicago and travel there for our appointments. 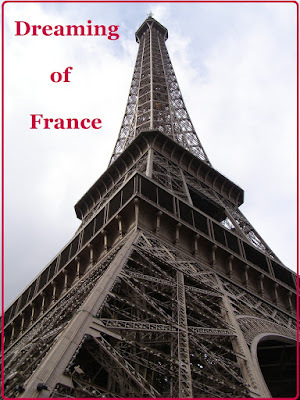 How can they turn down a Francophile like me? I pondered whether to write a funny or emotional post today. I'm still not sure which I'm writing yet. But I will tell you that when I got up this morning, I saw the cat on my laptop. "Get down!" I chided him. When I sat down at the keyboard later, I realized he had turned off my wifi connection and turned on airplane mode. I tried to move my mouse and realized he had also turned off my keypad. As I began grading papers, I saw that he had taken my one-page grading rubric and turned it into a 791-page document. He's more prolific at writing than I am! For some reason, I thought I needed to delete those 790 pages and get back to my first page. After several minutes of highlighting the pages from the end, I realized that I could just spike that document and start a new one. I'm not letting a cat outsmart me! That was such an easy dilemma, compared to what we went through on Monday. Tucker and two friends had driven to New York City to visit his former roommate then the four of them went camping in the Catskills. On Sunday, they drove back into the city, planning to drive home Monday. At 7:10 a.m., I received a text -- "On our way." It's about an 8-hour drive, so he should have been home by 3 p.m. An hour later, he called. He was at an auto shop because his battery light had come on. The mechanic said he needed a new alternator. "Get out of the city!" my husband urged. Meanwhile, I called the mechanic who had changed Tucker's oil and put new brakes on just the week before. He called back and said that the battery was new, but he hadn't changed the alternator on the 2002 Subaru. So it could need a new alternator. But he hypothesized that if Tucker drove home without lights or windshield wipers, the battery might just last. Tuck and his friends searched for a Firestone as they drove down the New Jersey turnpike and found out the price was higher than it had been in the city. They stopped at an Autozone and bought a new alternator, with Tucker's friend installing it, before hitting the road again. Then they called from the Pennsylvania turnpike. They had broken down when it started to rain, and they turned the windshield wipers on. After 30 minutes on hold with AAA, a turnpike worker came along and ordered them a tow truck. Of course, the entire ordeal was dotted with phone calls and texts and dying cell phones -- along with attempts to check out the eclipse. The tow truck driver told them that Autozone had a history of selling faulty alternators, so, for $68, he towed them to Autozone, where they found out they had the wrong alternator for their car. So an even exchange, a new alternator and they headed toward home again. They had had to pay $22 when they were towed off the turnpike halfway. After they drove the remainder of the turnpike, they couldn't find the card they received from the toll booth attendant, so they had to pay the entire amount, $44. The entire day, I just thought how much easier it must have been to parent before cell phones. Then I might, or might not have gotten a phone call to say that he had broken down, but he would have had to handle it. I love when a series of misadventures turns out okay, and you know that it will be a story he'll tell someday about the fun time they had camping in the Catskills. There's no turning back now. We have committed to housesitting for someone in France in January. That helps to cement our plans to move. We'll be staying in the Charentes area and taking care of a whole menagerie of animals while the other family goes on vacation. It should definitely be a goo immersion in France. My husband should retire in December, we'll celebrate Christmas here with our families and then fly to France. Of course, we still need some dominoes to fall into place -- like selling the house -- but the closer we get to actually moving to France, the more excited I am. We plan to housesit and rent in some different places to make sure the move is a good fit for us. It can start with a single housesit, but will hopefully snowball. Now we're really dreaming of France. Ooops. Sorry I'm running late. I'm on vacation in Florida and totally forgot about posting Dreaming of France today. One thing that I continue, no matter where in the world I am, is running. So here are a couple of shots that I took on my first run in France this spring. In Columbus where I live, the scenery doesn't change very much. It's pretty flat and I pass other runners and walkers with their dogs, but in the village Mireval, not far from Montpelier, I had a view of a ridge of mountains. Not a common sight for me. And the mountains got higher as I got closer. Plus look at that old stone wall. I wonder who built it and how long ago. In the distance was a village, and the spire of the local church stood above everything else. And some of the houses had lovely roses in bloom. Thanks for joining me as I dream of France. 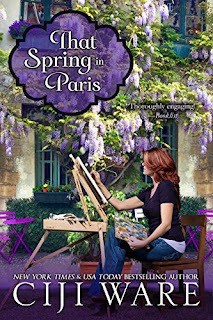 On Thursday I have a book review going up and a chance to win a copy of That Spring in Paris by Ciji Ware. I hope you'll come back. It's 4 o'clock and I haven't showered yet today because I have spent much of the day floating in my parents' pool. My day began around 7 with a run through fog, the air heavy with heat and humidity. After spending the entire day driving to Florida yesterday, it was a relief to be able to move. I passed an escaped dog and the golf cart with owners in pursuit. I had to do some class work on my computer but had promised Grace I would run with her so didn't take a shower. Grace has been inching toward running with a couch to 5k app. By the time she got up, it was pretty steamy out. Eureka! I had a genius idea. Let's do the walking and running in the swimming pool. So Mom, Grace and I did our 30 minutes of walking and running in the pool. Then we all floated on rafts and chatted. We got out for bathroom breaks and drinks. Grace gave in and went to shower, but I returned to the pool for more floating, watching clouds build up, white ibis fly over, and Sandhills cranes land in the yard nearby. From across the lake, I hear a train roll past with its horn echoing. A jungle-sounding insect makes repetitive clicks from the nearby lake and cicadas hum in the background. Mom and Grace tried sitting in lounge chairs to chat with me, but they got too hot. Not me. I was in the pool. Now I can hear a distant rumble of thunder so I suppose I'll have to abandon the pool, but I'm pretty sure I left my worries in the deep end. 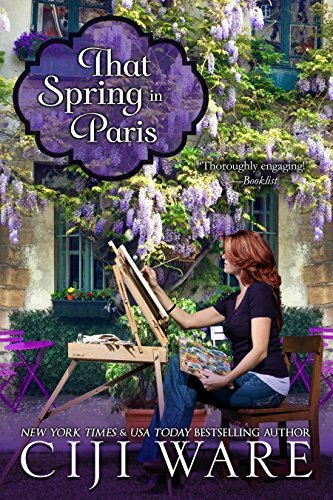 I'm reading another book set in France, and, of course, I always want to share with readers who are Dreaming of France like I am. from San Francisco to Paris after her best friend is injured in the Paris bombings in November of 2015. As she rushes into the hospital, she literally runs into Patrick, a former U.S. Air Force pilot, who is at the hospital to visit someone else mortally wounded in the attacks. The two form a supportive relationship and begin to battle their own demons connected to terrorism. Juliet works for a video game company that creates graphic war games and allows encrypted messaging, much like what the terrorists used to communicate with each other. And Patrick flew planes and then drones during the war, so he is dealing with PTSD. 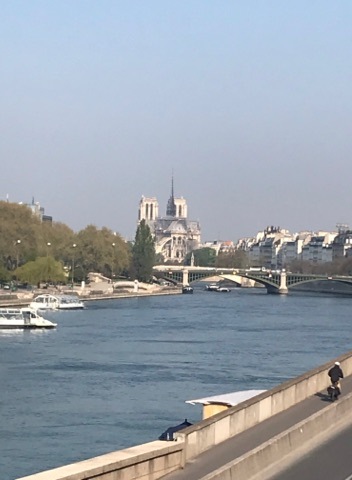 It's definitely a different look at Paris right after it has been swept by bombs and gunfire, but the strength and beauty of the city shine through, as the two watch to see when the Eiffel Tower will sparkle again, as it does eventually. I'll be reviewing this book for FranceBookTours on August 17 and there will be a giveaway too, so make sure you check back to have an opportunity to win it. Hey, I was in Paris during the spring, too. I'd better share a picture from my experience. I promise to blog more this week. My daughter and I are taking a mother-daughter trip to Florida. Can't wait.